I hope that you've all had a Merry Christmas! Done any modelling? Sneaked away from the turkey and the jollities for a few hours? Well I managed to do a bit more on the D49 between the pudding and the Port. Fortunately before the Port! 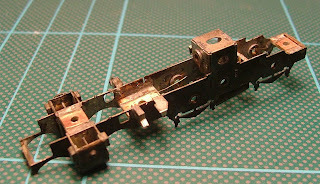 Having fabricated the various bits of motion, I proceed to fit the gears and driving wheels. First, though, I remove the frame extensions; carefully parting them from the frames proper with my piercing saw. The ends are cleaned up with a fine file. Additionally the frames need to be coloured. For the first time on a locomotive, I thought I would use Gun Blue rather than painting. This has the advantage of giving good coverage without the thickness built up with paint. Both methods seem to rub slightly with use, but a light oil of the blueing seems to prevent this somewhat. The fitting of the wheels was fairly straightforward and the drivers were soon in place and quartered; the coupling rods held in place with fine wire insulation. I then come to the motion; crossheads, slidebars and connecting rods. The slidebar slots into square holes in the cylinder face and a small pip at its rear lines up with the hanger, further back on the frame, when it is sufficiently inserted. Some fettling of the slidebar is required to get it far enough in. I have not soldered the slidebar to the cylinder, but merely tacked it to the hanger, being careful not to solder the crosshead at the same time! Similtaneously, the crosshead rod has been slid into the tubing in the cylinder and of course requires no soldering whatsoever. One at a time, the connecting rods are placed over the front wheel's crankpin and smooth running is sought. This took a little time and some further fettling of the slidebars was necessary as they had a tendancy to distort slightly during fitting. The second set required a little more attention than the first, but eventually all is in place and running smooth.